The start of Run Geordie Run Down Under ... with Benfield on October 16th 2013 will be very much like the start of the run across the USA was in 2011. The setting is a very beautiful beach with an iconic building close by. Of course, regular readers will remember that I started the 3100 mile run across the USA in 2011 at Ruby's Cafe on Huntington Beach. 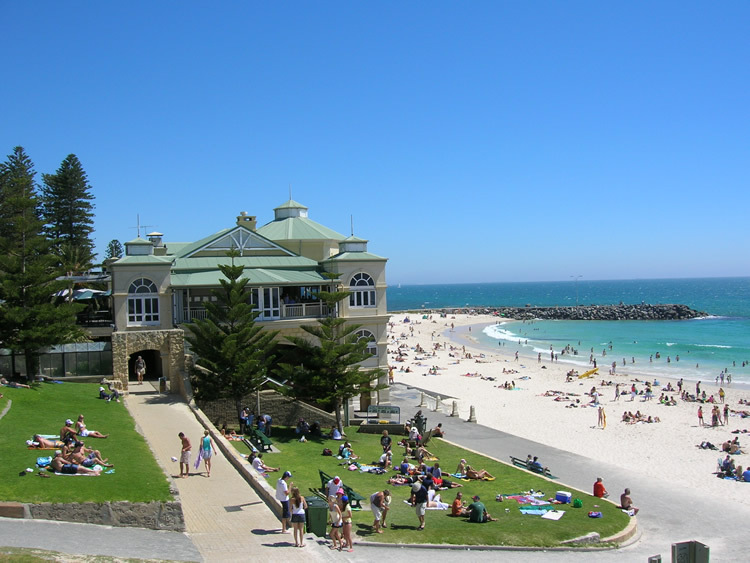 The start of the run across Australia will be in the sea next to the Pavilion on Cottesloe Beach in Perth, Western Australia (pictured below) at 7 am local time on on Wednesday 16th October 2013. That means I'll be starting the run at midnight UK time on the 16th October. It will be brilliant to see as many locals, ex-pats and exiled Geordies at the start line as possible. I've received numerous emails and tweets over the last 12 months and it sounds like there will be quite a good turnout. It will be nice to have a good send off and start the run in good company. Everyone is welcome at the start and I'm really looking forward to getting the run underway in just 20 days time! Incidentally, the water at Cottesloe Beach was off limits for a short time last weekend due to "shark activity"! What can go wrong when I get there?! North East family owned motor group Benfield Motor Group were recently announced as the headline sponsors for the up and coming run across Australia. The announcement was greeted with great personal relief and ensures that the run can now go ahead in a much safer manner than was previously possible. i.e. I now have the finances in place to pay for the RV motor home that will house and support myself and the team for 70 days. I've been a social media ambassador for the company for 18 months and I'm so pleased that we have been able to take that particular relationship much further. With immediate effect Benfield will headline the current main sponsorship group of Brooks, Cherry Active, Chapman Ventilation, Identicom, Sport Newcastle and Virgin Money. 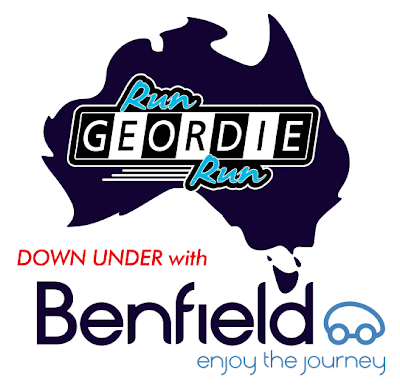 As part of the headline sponsorship arrangement, my 2600 mile effort down under will now be known as Run Geordie Run Down Under with ... Benfield. The very snazzy logo for the run (below) will be seen on my blog, Facebook page, Twitter etc. There was a short and informal ceremony on the Beach on the Quayside this afternoon. Benfield, most fittingly, asked Liz Luff from the Sir Bobby Robson Foundation and Libby Nolan from The Children's Foundation (both pictured below) to present me with the shirt that I'll be wearing during the Benfield Australia Run. It might seem like just a running shirt but I've got to say that, as soon as I put it on, I really started to feel like that athlete who finished the run across the USA in 2011. I started to feel like Run Geordie Run again. It must have been how Clark Kent felt in Superman II when he regained his powers and became Superman again. I'm waffling there, but you get the general idea I'm sure! That running shirt is going to make a quite incredible journey over the next few months. More than anyone will ever know, I'm looking forward to it coming full circle and presenting the shirt back to Benfield once the run is over. The Benfield motto is "Enjoy the journey". If this shirt isn't something that isn't going to do exactly that then I don't know what is. As an aside, I should point out that Benfield's Facebook and Twitter pages run a free weekly online competition called Enjoy Rewards. They are well worth checking out and only take seconds to enter. I've noticed that some of my own social media followers have been lucky enough to win such things as annual passes to Alnwick Gardens, full car valets, tickets for Newcastle Falcons matches and I myself won tickets to the recent Athletics at Gateshead Stadium whose lineup including Mo Farah! Thank you once again to Benfield and all of my other main sponsors for giving me the best possible chance of success in Australia. It's now down to me to do them, The Sir Bobby Robson Foundation and The Children's Foundation proud. Running 2600 miles in 70 days with a fundraising target of £50,000 is going to be incredibly difficult. 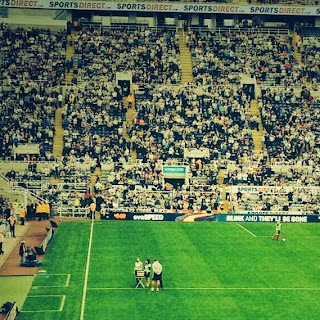 As ever, I will leave absolutely no ounce of energy in my body before I achieve success for the 2 charities as "Run Geordie Run Down Under ... with Benfield"
I was fortunate enough to get onto the pitch during the half time break at last Saturday's Newcastle match with Hull. It was good to talk to Justin Lockwood and tell the crowd about the up and coming run across Australia. I managed to get all of the important details across about the run as well as the 2 charities. Hopefully that was the start of reminding those people in the stadium that Run Geordie Run is about to embark on yet another huge run. 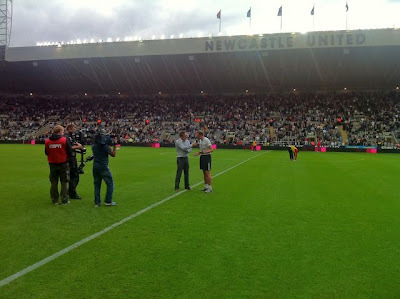 News of my half time appearance was reported on nufc.com today. Biffa and Niall, who are the hosts of the site, have backed and publicised my runs for over 12 years. Their support has seen tens of thousands of pounds pledged by Newcastle United supporters, from all over the globe, who read their site. It was no coincidence that by the end of today the charity fund for The Sir Bobby Robson Foundation and The Children's Foundation had passed through the £12,000 barrier. Thank you to those kind people who have sponsored me so far. The charity fund currently sits at £12,020. 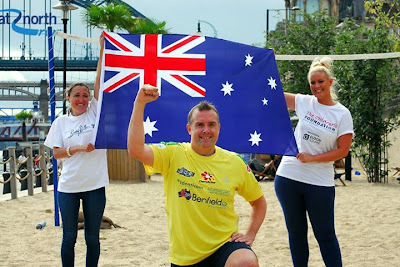 If you would like to sponsor my efforts "down under" then, as ever, all donations no matter how large or small will be very gratefully received. Please use the link below to donate using Virgin Money Giving. Thanks in advance. It's time to continue the series of blog posts where I introduce my support team to the readers of rungeordierun.com. I've already talked about Graham, Jason and Carlton. The latter will be joined by Dave and Ian on day 39 in Port Augusta at the 1476 mile point. 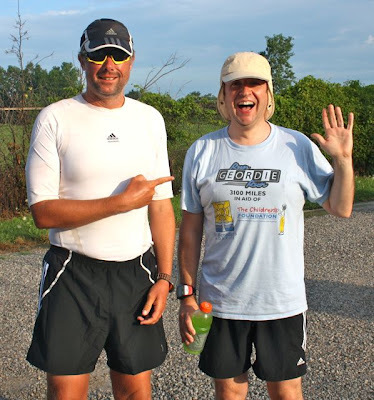 Like Carlton, personal trainer Dave (pictured with me below) is no stranger to my runs and of course famously supported me during two sections of the run across the USA. Regular readers will know all about Dave and the important role he played during the run across the USA. For those that don't know, Dave has overseen my training for the last few years and also takes on the role as my mentor. Ian is one of Dave's clients and lost 12 stone in weight recently! That is an astonishing achievement as you can see from the before and after images below. Ian is a fellow Newcastle supporter and I'm sure we'll have plenty of football related tales to recount. Ian has trained this year to accompany me on the run. He plans to do 10 half marathons in 10 of the days that he's on the support team. Carlton, Dave and Ian's sole mission, during their 6 days on the team together, is to ensure that I reach mile 1675 at Victoria Square Fountain in Adelaide on time on day 44. It is at that point that Carlton leaves and the final team member, my partner Donna, joins the team. I'll talk about that final configuration of the support team in a future blog post. In the meantime, Dave had the following to say about his forthcoming time on the team: "Mark's run across the USA was an extraordinary achievement but running 41 miles a day across Australia in their summer is bordering suicidal. However, if anyone is mentally strong enough to attack and achieve this challenge it's Mark. The lessons learned in his USA run, I feel, will be critical to the success of this run. Many mistakes were made including, at one point, being 165 miles behind schedule. That simply can't happen this time. The heat and terrain will not allow Mark to pull back that sort of mileage deficit. This time Mark has a clear game plan and it's up to us, the support team, to make sure he sticks to it and stays focused. If you think being a member of the support team is easy then think again! When Mark is physically and mentally exhausted, which is most of the time, knowing what to say and do for the best isn’t always easy. There is a thin line between pushing Mark too far, which could cause him to become demotivated, or saying something which will spark him in to life! Humour is often the best tactic and worked well in the USA. I have kept plenty of stories to share with Mark in Oz so Mark Fleming look out as I haven’t forgiven you for telling the world about my altercation with the highway patrol when we had been in USA less than 2 hours last time! The support team will also be contributing to the blog this time so you will be able to read what tactics we have used to keep Mark on track, on time and on target for another epic journey…I cant wait.". Ian (pictured above before his dramatic weight loss) added "I joined the support team to help Mark (in a very small way) to achieve this crazy challenge and also set myself a new target at the same time. I first met Mark in April 2012, when I was part of Dave Fairlamb first 'fit factor group'. In the first week, Mark gave us a speech and an insight into what can be achieved when you are fully focussed and committed to achieving a target, following his run across America. Mark ran the 2 miles on Tynemouth Longsands with the group of 8, which was the first time I had ran anywhere for almost 30 years (when I say ran I should say slow jog or fast walk). 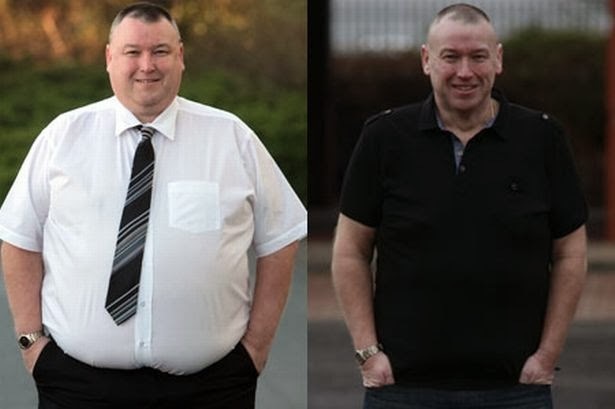 I found Mark's story and words very helpful and indeed inspirational and this helped me achieve the weight loss and improved fitness I gained over the last 15 months, losing over 11 stone. 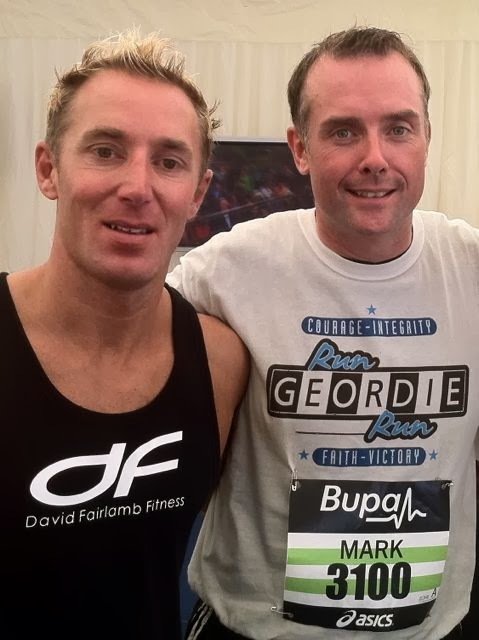 I was asked by Dave Fairlamb at the start of this year as to whether I fancied going to Australia with him to help Mark by running with him a few miles and drive the support car. In a moment of weakness, whilst we were in a pub I agreed, but I was more thinking of driving the car, catching the sun and seeing Australia, rather than doing much running. It will be great to get to know Mark better over the two weeks in Oz, even though I expect to see a lot of the miserable grumpy Mark in the circumstances. I have set myself a target of running 130 miles in 10 days to help Mark and to avoid Mark having to listen to Dave's Wham music all day! This will hopefully allow me to hit my weight target of 15 stone, which will have been inspired from start (at Tynemouth) to finish (in Oz) by Mark. I am not looking forward to running in the dark, so the hardest part will be getting Mark out of bed for the earliest start possible each day. I am also not looking forward to sleeping in an RV with Mark and 3 others for 2 weeks, especially as there is only 1 shower which is designed for a midget and limited water supply, which sounds like it will be a shower every 3 or 4 days. What will Dave Fairlamb's hair look like! (we will have to get some shots for the Journal of Dave with unkempt hair- that should raise a few £ for charity even if it's just Dave paying to keep them out the papers). I am sure we will have a few laughs with a number of insects and snakes finding their way into the cases, but who will be brave enough to take the risk of dismissing them as fakes! The sense of humour will be very important as they say ' if we can't laugh I am sure we will cry'. I hope to be able to help Mark do the 41 miles a day by passing the time in getting to know each other better and 'chewing the fat' about our views on one of our mutual passions 'the Toon'. We have both been staunch Toon fans for many years and we will be able to share our thoughts and memories on the best and worst players and games as well as testing our knowledge of the Toon (we will see how much he really knows when I take the toon history books with me and I will give him his score out of 10 or 20 each day). We will also have 41 miles a day of think of various ways to 'wind Dave up' each night!" Dave and Ian will leave the support team on day 52 at the 1962 mile point in Piangil near the Victoria/New South Wales border. It's nice to see that Ian is also planning on winding Dave up at every opportunity. Watch out for details of that on this blog as and when it happens. Dave and Ian are on Twitter and can be found at @df_fitness and iangibs13 respectively. Imagine the scene. It's Mr McIntyre's Year 6 class at Woodlea Primary in Fencehouses and the children are all set to learn about their new topic; Australia. This was about the time when young Josh raised his hand and told the teacher that his Dad's friend was soon going to be running across Australia. At first Mr McIntyre looked at Josh in disbelief. Then Josh pointed his teacher in the direction of www.rungeordierun.com to prove that he wasn't telling a tall story. Let's face it, I'm sure we all used to tell them at school. I know I did! When Josh's Dad, Ian, told me what had happened I offered to do an assembly or classroom visit when I return from Australia. Josh's Dad, Ian, contacted the headmaster who knew all about Run Geordie Run. I'm told that the headmaster was very excited at the prospect of a "show and tell" visit from yours truly in January. I'm sure that there will be plenty of stories to pass on to the children at Woodlea Primary after I have finished the run across Australia. I will make sure to tell them all about the spiders, snakes and perhaps throw in a few tall stories of my own! 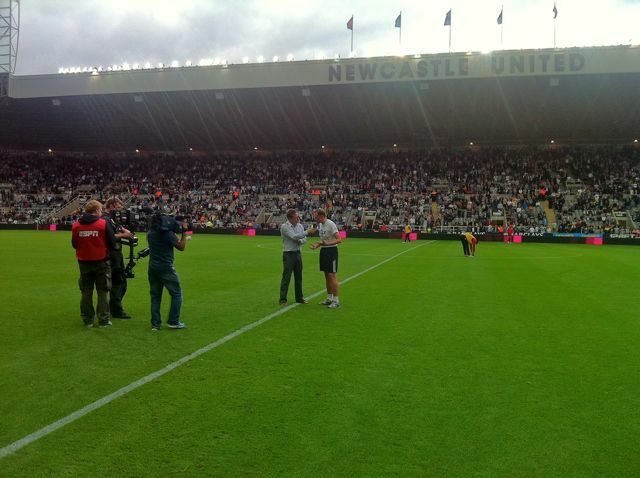 If you're at the Newcastle v Hull match this Saturday then please look out for me on the pitch at half time. I'll be talking to the half time presenter Justin Lockwood about the up and coming Benfield Australia Run. There'll only be 25 days left before the run starts by then! Speaking of Newcastle, I'll be missing 7 home games while I'm in Australia. The last time I missed that many was the 1987/88 season when I was daft enough to get a Saturday job. I got the job to be able to afford to go to the match. I quit the shelf stacking job in time for the following season as I'd saved enough money to go to the match! I'm looking forward to getting on the pitch and raising the profile of the run amongst my fellow Newcastle United supporters. Here's hoping it's a great day all round and we manage to get 3 points. With only 30 days to go before the start of the Benfield Australia Run, I had a catch up with Gary and Lisa on the Real Radio Breakfast Show this morning. I particularly liked the new jingle they had created for me. You can hear the interview in full using the link below. 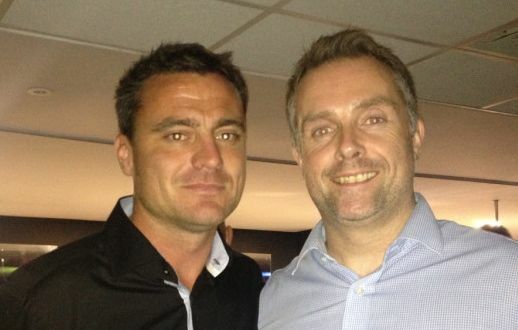 It was a real honour and privilege to be invited to attend Steve Harper's charity testimonial match with The Sir Bobby Robson Foundation last night at St James Park. I was thrilled to be in the company of Lady Elsie Robson, her family and the NHS administrators that the charity uses. I really enjoyed watching the players in black and white that I once watched week in week. 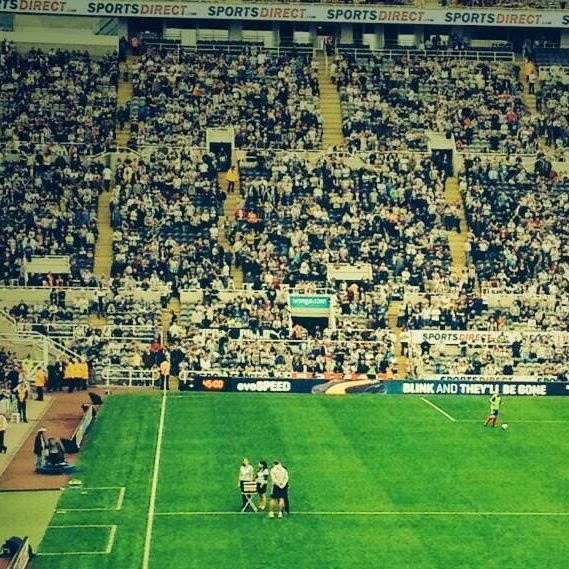 The attendance of over 50,000 for a Newcastle legends team against an AC Milan Glorie side was testament to Steven Harper, how well he is thought of by the supporters and the loyalty that he gave Newcastle in a career spanning 20 years. Moreover, I'm sure that the match will have raised a huge sum of money for 3 good causes in the region; The Newcastle United Foundation, The Great North Children's Hospital and The Sir Bobby Robson Foundation. After the match, I spoke at length to Sir Bobby's son, Mark, about the up and coming Benfield Australia Run and how the planning and preparation had been going. I was also lucky enough to learn more about the Foundation's future plans. 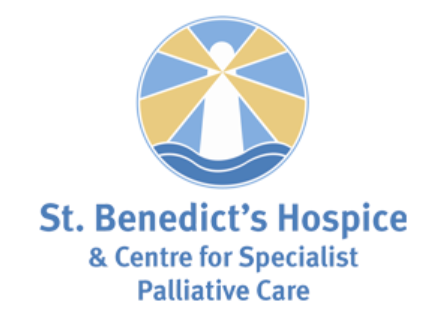 Not that I needed it, but it was a reminder as to why I made the carefully considered decision to switch my fundraising efforts from St Benedict's Hospice to The Sir Bobby Robson Foundation in 2012. I was also lucky enough to meet an inspirational family who have directly benefitted from a trial undertaken at the Sir Bobby Robson Cancer Trials Centre. Coincidentally, it was the person undergoing the trial's birthday. His wife commented that "This time last year we didn't know if he would get to this birthday. But the work of the Sir Bobby Robson Foundation made it happen". Hearing that statement following the earlier discussion I had with Mark Robson underlined the importance of the work that the Sir Bobby Robson Foundation does. The following statement that I made on this blog last year sprang to mind: "For me, this is now about helping to raise funds to allow the experts to find a cure for this terrible disease. A cure that may, indeed, have saved my parents lives had it been found. It may take many generations to beat the disease. The generation that currently exists right here and right now can really play their part in the fight against cancer. The Sir Bobby Robson Foundation is one of many such charities that are fighting the disease through trial and research in our world. It has a huge part to play in this ongoing battle.". Lady Elsie's parting words to me were "If I don't see you, good luck in Australia!". Brilliant! I loved that. I've met Sir Bobby Robson's family on a few occasions and it always strikes me how very down to earth and, quite frankly, how very lovely they are. Speaking of being "down to earth", I managed to talk to Steve Harper (pictured with me below) and congratulate him on putting together such a great event. He was a very friendly person indeed. I was totally gobsmacked that he knew about my running exploits and he had a lot of very kind things to say. He wished me luck for the Australia run and it rounded off a quite incredible evening for me personally. Well done to Steve Harper, the rest of the players and the 50,793 supporters whose support is going to benefit 3 brilliant North East charities. 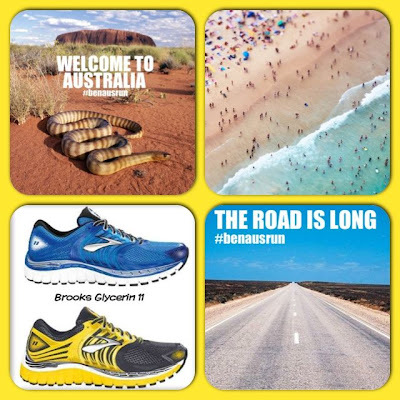 There are lots of different ways to follow the Benfield Run Across Australia. I have a Facebook page, Twitter feed and You Tube channel. You'll find links to these in the header of this blog. The latest social media tool to be added to this list is Instagram. Click on the image below to see what is on that page. It's time to continue the series of blog posts where I introduce the Benfield Australia Run support team to the readers of rungeordierun.com. I've already talked about Graham who I believe I stand the best chance of getting a flying start to the run with and it is for that reason he is first on the support rota. Next up was Jason who is a very talented physio and joins the team with a very good reputation. He is young and keen and is ideally placed as the second person on the support rota. I'll have the luxury of a full 3 weeks of treatment from Jason and we will cross the Nullarbor region of Australia while he is on the tour. Ladies and gents, without further adieu, may I present to you, *drum roll* Carlton (pictured below at the start of his support team duties in the USA). Carlton is a work colleague and is no stranger to supporting my events. He was last seen on the final crucial leg of the run across the USA. 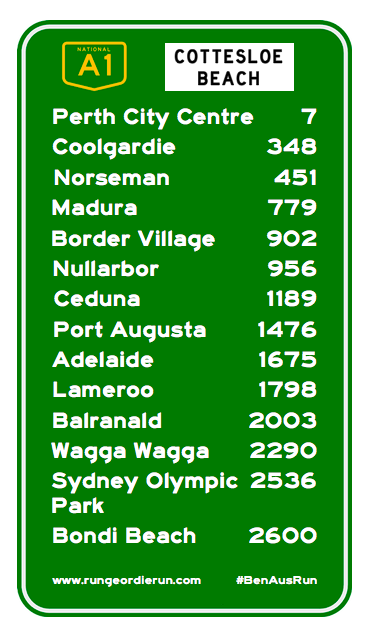 Carlton will join the tour on day 31 in Penong, South Australia at the 1148 mile point. Carlton's first day will be Jason's last day. 8 days and 328 miles later Dave and Ian (who I'll write about next week) will join Carlton. The 3 of them will be on the tour together for a further 6 days. That period of the Benfield Australia Run is critical and to have that particular configuration of the team will give me an excellent chance of reaching mile 1675 in Adelaide on time on day 45. It may arguably turn out to be one of the most important 6 days of the entire run. For numerous reasons, it's so important that I'm in Adelaide on time. There is the small matter of another changeover of support team but I also hope to be doing a few school visits. Anyway, lets not get too far ahead of things for now. This post is to introduce Carlton to the readers of my blog. I believe that each team member brings their own unique talents to the Benfield Australia Run and Carlton is no exception. To say that Carlton has a unique approach to support duties is an understatement! His methods have worked very well in the past. Of that there it little doubt. We got to New York on time, for instance, after overcoming a deficit of 160 miles during the final 2 weeks of the run across the USA. His wicked sense of humour together with the team spirit he can drum up when the chips are down are second to none. He is not afraid to get his hands dirty as you can see from the picture below. That was taken when Carlton emptied the RV sewerage tank for the first time in the USA. Not doing that particular task is one of the perks of running 41 miles per day! I asked Carlton to tell the readers a bit about himself and his previous involvement with my running. This is what he wrote: "My name is Carlton Fletcher and I was part of the Run Geordie Run Support Team across America and I am here again to support Mark once more. I doubt very much that Austria will present anything like as much of a challenge though. My time in the USA was an incredible experience from start to finish. There were so many memories; from the police pepper spray attack at the greyhound station when I arrived, showering outdoors in a thunderstorm, the "incident that we don't talk about" or the time I nearly killed us both on the way back to the RV drop off centre just after the run finished. Happy memories. There were some real lows and things I didn't tell Mark about for fear of affecting his morale. The one thing that I told my wife and family when I got back home was "Don't ever let me do anything like that again". But there were some great time too. The camaraderie; the games we invented and played whilst out running; the way Mark would throw a rock into the bushes when it got dark to make me jump; carrying 4 litres of water up hill for 5 miles on days when Mark wasn't that thirsty. Ah, happy days! And I genuinely feel like I contributed to his success. I know I helped pull him around from being 160 miles behind schedule when I arrived, to completing his challenge 2 weeks later (albeit after a monumental ultra marathon last day). In the USA, I organised sponsored meal times, and more popularly, sponsored waste dumping and underwear washes. This time I have come up with something different to try and raise a little extra sponsor money and keep Mark motivated. He will just have to wait and see what it is. You can follow my lows and, erm, lows, hopefully peppered with a bit of humour on Twitter @carltonf46. I will do my best to make sure that when I leave Mark in the care of David and Ian, he'll still be on target for yet another incredible achievement.". Thank you Carlton for those "kind" words. As Carlton mentioned, you can follow him on Twitter (@carltonf46) where he will be giving his own view of things in the build up and during the run itself. I'll talk soon about the remaining members of the team; Dave, Ian and Donna.